Rome Transfer provides efficient and timely transfers services from airports Rome Fiumicino, Rome Ciampino and transfers from Fiumicino to Civitavecchia port and Civitavecchia to Rome Town , fixed and affordable rates ,with vehicles from 1 to 52 people. In the airports and ports you'll find our drivers (with all permissions and passes) waiting for you in the terminal avoiding long queues at the taxi stand. Transfers 'Rome Fiumicino Airport to Rome centre. Rome Transfer performs transfers directly from Leonardo Da Vinci airport to Rome centre and viceversa with punctuality and avoid you to wasting time in the chaotic Roman traffic thanks to satellite equipments in every our vehicle. Rome Transfer makes transfers from Ciampino airport to Rome centre and viceversa with fast connections within few minutes you will always arrive always on time to your destination. 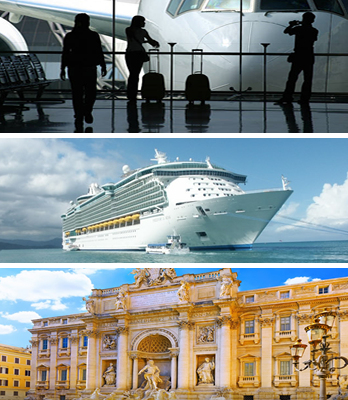 Rome Transfer makes transfers from Civitavecchia port to Rome centre and viceversa with punctuality.